Firm Spout Non Spill Cup. Lovi Firm Spout Non Spill Cup is a BPA free, non-spill cup with firm spout which is especially designed for babies with first teeth. The baby cannot bite off the firm spout so it is not a choking hazard. The Non spill cup has ergonomic design which helps the child to hold it correctly. The drinking cup comes with convenient, removable handles and is just right size for the baby to carry independently. The Non Spill Valve can adjust liquid flow according to baby?s suction. 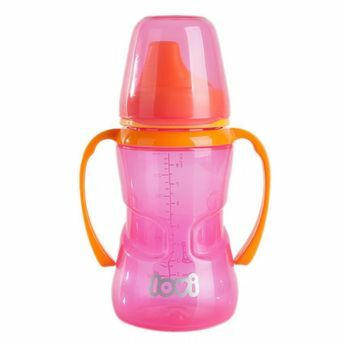 The handles and the spout are compatible with LOVI bottles so it is easier to wean the baby. The cup is comfortable while traveling or during playtime for active toddlers. Hard spout for babies with teeth. Built in valve can adjust liquid flow according to baby's suction. Efficient: Non Spill valve controls the amount of liquid according to baby?s suction. Soft: Protects baby?s gums and first teeth. Sturdy: Does not break easily even when chewed by the baby. Material: Cup, Cap, Cover and Handles: PP, Spout: TPR. Origin: Thailand: Cup, Cap, Cover. 1x250 ml cup, 1x hard spout screw cap, 1x silicone valve, 1xhood/cup with scale.